TMS Treatment and Insurance: Will my treatment be covered? TMS Treatment and Insurance Coverage: Will my treatment be covered? Navigating insurance coverage can be confusing and overwhelming. When you are dealing with depression, coordinating treatment with your insurance provider is probably the last thing you want to think about. We are here to help. When it comes to your mental health, it is vital to know exactly how your health insurance policy works and what kind of mental health treatment you can expect to receive. Take a look below at some information we’ve compiled that relates to using health insurance to cover some or all of the cost of treatment. Because TMS has been cleared by the FDA to treat depression, most commercial health insurance providers cover Transcranial Magnetic Stimulation treatment. This is great news for our patients who are looking for alternative treatments to depression. Our office is “in network” with multiple major insurance providers across California and Oregon, and are also able to pursue out of network benefits if we don’t happen to be in network with your insurance company. Unfortunately, in California, Medicaid (Medi-Cal) does not currently cover TMS treatment on any of their policies. If you have Medi-cal, we encourage you to contact your state and local representatives to advocate for more mental health coverage options, like TMS. What is “In Network” versus “Out of Network” coverage? Doctors’ offices go through a lengthy contracting process to be able to accept certain insurances. When a doctor’s office is “in network” with an insurance, it simply means that the insurance company and the doctor’s office have come to an agreement on things like reimbursement and treatment terms and conditions. This makes billing and authorizations with that insurance company much easier because all of the negotiating has already taken place. Does this mean you can’t be treated at our office if you have an out of network insurance? Absolutely not. Our office is able to accept out of network insurance coverage in many cases. If you have an out of network insurance, we may be able to request a Single Case Agreement (SCA) from your insurance company. This process can take a little longer because the negotiations between our office and your insurance haven’t taken place. Our intake coordinators investigate your policy thoroughly and will work with you to help understand your options if you have an out of network policy. In the case of Blue Shield of California, we are able to accept that insurance if the mental health benefits carve out through Magellan. Carve Out Plan? What does that mean? Often insurance companies use a different vendor to administer mental health benefits. For example, Blue Shield of California typically uses a company called Magellan Health. In most cases, your insurance card won’t mention anything about this, but in the policy paperwork you receive when you sign up for your plan, it will probably include these details. If our office is in network with the “carve out” then we are able to use in network benefits, even if we are not in network with the main provider. If you have questions about who administers the mental health benefits for your plan, check your policy information or give your insurance company a quick call. The member services number will be on your insurance card. Our office also checks this information for you after a free consultation. How much of the cost of treatment is covered by my insurance? Coverage varies from insurance to insurance, and the type of plan you have chosen. Some policies cover the entire cost of treatment, while some have a copay, or deductible, coinsurance, or both. When you visit our office for a free consultation, you will be assigned to work with an Intake Coordinator. Our Intake Coordinators are highly trained and have extensive experience working with insurance companies. After your free consultation, we reach out to your insurance directly and request what is commonly referred to as a “Quote of Benefits”. 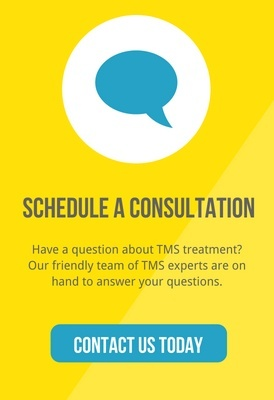 This is a courtesy that our office completes to help you understand your benefits, but we also encourage our patients to contact their insurance provider directly to find out what their coverage for TMS is. Any quotes given to our office are not a guarantee of payment, but rather a statement of the benefits of a specific plan, including any exclusions and limitations of the plan. While every plan is different, we run into several similar types of coverage. If you have a plan that has a deductible, you must meet that deductible before your insurance will start paying their portion. Until that deductible is met, all visits would be out of pocket. Some insurances combine the mental health deductible with the medical deductible, but not always. You may have a separate deductible just for mental health services. Once that deductible has been met, your insurance will then have a set percentage of the cost that they cover. Sometimes they cover 100% after the deductible, but in most cases, subscribers have a coinsurance. Coinsurance can also be referred to as “patient responsibility” or “cost-share”. If your plan has a coinsurance, this just means that you share the responsibility of paying for a portion of your treatment. For example, if your insurance covers 90% of the cost of treatment, your coinsurance would be 10%. Because the cost can vary depending on the negotiations between your insurance and our office, we do our best to give an approximate amount for all plans with a coinsurance when we go over your Quote of Benefits. Insurance plans with a copay are much more straightforward. Insurance companies consider each daily treatment an individual office visit, which means you will pay the copay each time you come to treatment. Most insurance companies authorize anywhere from 20-40 visits depending on their medical guidelines, so the total out of pocket expenses will depend on the number of visits approved. Does my insurance require anything else to get treatment like a referral? Because TMS is considered a higher level of care, most insurance providers require that our office get a pre-authorization prior to starting treatment. This is different than a referral, and must be submitted directly to your insurance provider from our office. During your free consultation, we will gather some information that insurance requires for the pre-authorization request, like medication history and any other treatments you have tried. After your free consultation, you will meet with one of our psychiatrists for an evaluation. Once our psychiatrist determines that TMS is a good option for your individual needs, they will make a recommendation that we will also submit to your insurance. Insurance companies have medical guidelines that must be met before TMS will be authorized. We have found that most often, insurance providers require a patient to have tried at least one kind of therapy like CBT, and around 4 antidepressants. However, all insurance providers requirements are different, and our Intake Coordinator will go over any specific requirements your insurance may have. How long does it take to get the authorization after I see the doctor? If our office is in network with your insurance, the authorization process does not take very long. Our office submits your pre-authorization immediately after your evaluation with our doctor. From there, it is subject to the processing time of your insurance. Most in network providers make a determination within 5-7 business days, however we have seen some take up to 15 business days. If we are working with you to get a single case agreement with an out of network insurance, the process could take up to 30 days or more, depending on the willingness of your insurance to work with our office. We make every effort to expedite the authorization process for treatment. It is important to note that TMS is not an emergency treatment, so if you are experiencing distress or a medical emergency, we encourage you to call 911 or go to your nearest emergency room. We understand the time and effort that goes into pursuing treatment, which is why our office has dedicated staff to help you get started with TMS treatment. Our Intake Coordinators will work with you to help understand your benefits and what to expect from the process if you are using insurance. We look forward to working with all prospective patients and family members and advocating for mental wellness. Achieve TMS is the leading provider of Deep Transcranial Magnetic Stimulation depression treatments. With over 600 patients treated and countless success stories, we’ve brought hope back to those who have been suffering in silence.